Captain Marcus Asante sailing on the Chesapeake Bay. 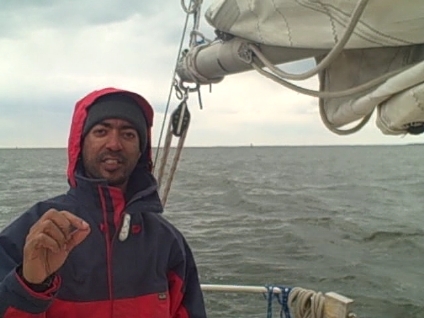 Episode 22 of the Shooting the Breeze Sailing Podcast features a new interview with Harrisburg, PA native, and Baltimore, MD resident maritime historian and sailor Marcus Asante. He stopped by a few days ago and we shot the breeze for about three hours about the Volvo Ocean Race, how he got into paddling and sailing, and his community efforts in spreading the word about the area’s maritime history and his love of sailing. This is part 1 of 2, look for the next episode in a week or so. You can check out Marcus at the Marine Arts Institute. Music for the in between parts courtesy of The Ogham Stones, also featured on the Hootenanny Down the Hall Music Podcast.